Fourth Row Center: Film Writings by Jason Bailey: Tribeca: "Lola"
A film like Lola is like a dare to the critic that considers himself even remotely intellectual. It is a naturalistic art picture from the Philippines, a tale of poor people in unfortunate circumstances, done in a semi-documentary style. It is the kind of film a critic fears; confess that it bored you to tears (which Lola does), and you seem some kind of a philistine, a Michael Bay-loving heathen who didn’t “get it.” It’s a risk this critic will have to take; Lola put me to sleep while somehow, simultaneously, giving me both a headache and a stomach ache. The wordless opening scenes, in which the handheld camera follows an old woman and a young boy through the streets of Manila, seem deliberately designed to make us recalibrate our requirements for pace and action; the takes are long and languid, and there’s not a lot happening within them. But we appreciate the cleaning of the slate—we ready to go where director Brillante Mendoza wants to take us. 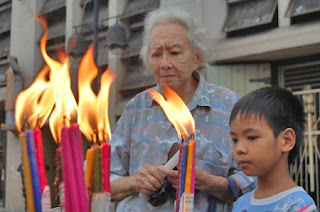 The old woman, whose name is Lola, is visiting the spot where her grandson was murdered, and then making arrangements accordingly—shopping for a casket (“We have a wide selection of cheaper ones”), visiting the police station. There, the camera slides away to another grandmother; she is there to visit her grandson, who is accused of committing the murder. The rest of the narrative (such as it is) rotates between the two women, as both attempt to scrape money together from their meager surroundings—one to pay for her grandson’s burial, the other to pay for her grandson’s defense or, alternately, to make “an amicable settlement” to the deceased’s family to drop the charges. There are no false conflicts; indeed, voices are seldom even raised. Mendoza seems determined to keep the film as close to the ground as possible. That works as anthropology, but not so much as drama. The minimal editing and lack of sensational activity may be more “truthful” (whatever the hell that means anymore), but it wreaks havoc on the pacing; the film runs 110 minutes, and boy, you can feel every minute of it. The slice-of-life approach is appreciated, but some judicious editing could have brought the film off far more effectively; it’s full of scenes (the long dinner, the visit to the lender) that make an impression, but they go on and on, boggled down with minutiae, and they stop the picture cold. And then there’s the photography. Handheld cinematography is (most examples of it to the contrary) an art, and there is a grace about it that is required, lest we put off the viewer. I’ve never been one to complain about handheld overload, and indeed, cinematographer Odyssey Flores occasionally finds a haunting (and seemingly unprepared) image, like the casket in a boat floating down the flooded street. But for the most part, the photography is clunky and amateurish, and an hour and fifty minutes of it is too, too much. Lola has its moments—the performances are believable, the mood is palpable, the details seemingly authentic. And Mendoza certainly seems a filmmaker who is absolutely uninterested in compromising; his film is what it is, and there you go. But it doesn’t play. Many will look at his refusal to dramatize and proclaim the result to be some kind of masterpiece. They have been blessed with good intentions, but poor judgment. "Lola" screens April 22, 23, and 24 as part of the 2010 Tribeca Film Festival.